there was a woman with a dream. She liked to shop for gifts for friends, family and co-workers, but found that finding the time and the right product was a challenge. So she decided to make it easier for others by simplifying the process. And in 1996 Babybox.com was born. Now this woman wasn’t content to just sell a bib here or a mass-produced toy there. Oh no, she wanted to sell only the highest quality baby products that she could find. She also wanted the process to be easy, as she knew how precious time could be. Who has the time to shop umpteen numbers of stores to find the right product that you desire? Some do, but enough other people struggle with time management during the day and just want to go home to relax at the end of it. Hence online shopping was key to Babybox.com‘s mission. Shopping from your own home simplifies any shopping experience, especially when helpful customer service representatives are just a quick phone call away to help you with your shopping needs. Sometimes the magic of a gift is in the packaging of it though. Who doesn’t recall the excitement of staring at an unopened present, wondering what could possibly be inside? What would Christmas and birthdays be like without that thrill? That’s why Babybox.com also makes the effort to present all of our orders in beautiful packaging. Sometimes the surprise is just as important as the gift itself and we know that. Ultimately, the vision was all about babies though. They are a wonderful addition to any family and Babybox.com celebrates that. We offer personalized gifts, custom-made furniture, unique on-of-a-kind items, and products that are just plain perfect for kids. Because not only did Katherine Styne Type want all of this for her customers, but she has a family of her own that deserve only the best as well. So if you are wondering where to find a great baby gift, try Babybox.com. Katherine had a vision 17 years ago, and it has only grown bigger through the years. See why she stands out in the e-commerce marketplace today! Since we are all about personalization at Babybox.com, planning and anticipation are natural bedfellows. If you want to personalize a gift, you need to think about what you want, how you want an item personalized, and what that message should say. That can take time and much thought in creating that perfect gift for the one you love. It also means that it takes time for us to make the item you want to your specifications. The process only begins once your order is in. Sometimes it can be a short turnover, but other times it may take longer to create the perfect item for you. Craftsmanship is something we take seriously. It equals quality and that is what we want for you, the customer. So before time gets away on you, why not put some thought into the upcoming holidays. Christmas is less than three months away. Hanukkah is two months and counting. It just so happens that Thanksgiving is on the same day as Hanukkah this year. And of course Halloween will be here in four weeks. All of these celebrations are exciting. And Babybox.com has items that can be personalized for all of these celebrations. It just takes a little planning on your part to ensure that you order your special gifts in time to receive your personalized items before the celebration arrive. This personalized hanukkah pattern classic long sleeve tee shirt (youth size) will look adorable on any child. Designed with pink and gray hanukkah print, it is classic and unique. Same style as our classic style long sleeve tee, but available in larger sizes for older children. Made from 100% cotton and easy to care for. Available in size 8, 10 or 12. Shirts available in your choice of several colors: Available in white, pink or brown. Made out of 100% cotton. This shirt is also available in 9 other styles. It usually ships in 1-2 weeks. This personalized Christmas ornament featuring contemporary tree design will light up your tree and be a wonderful addition to your holiday decorations. The ornament is handpainted with modern colorful design and each tile is finished at the top with a coordinating ribbon for hanging. Personalized with your child’s first name and year, each ornament is heat sealed using original artwork. Makes a wonderful keepsake. It usually ships in 4-6 weeks. Add fun to the meals of your child with this adorable Thanksgiving plate featuring a beautiful design. It can be personalized in your choice of design, color and font. It measures approximately 10 inches in diameter and is BPA free, non-toxic and dishwasher safe. The plate features a matte finish and is made of melamine that makes it indestructible and safe for children of all age groups. It makes a pleasant gift item for the child that will be treasured for the long time. It usually ships in 2-3 weeks. This baby’s first Halloween set is perfect for your little trick-or-treater. Perfect as a Halloween “costume”, this set includes a onesie with matching bib and burp cloth decorated with Pumpkin, Candy Corn or Boo centerpiece. 100% high quality 100% soft cotton interlock onesie is just adorable. More than just a t-shirt, but an essential fashion statement for any baby. Sizes: 6 months (up to 14 lbs. ); 12 months (up to 22 lbs.). It usually ships in 3-4 business days. If you want to personalize a gift this holiday season, start the process today – get shopping! The nesting instinct kicked in this weekend in my neighborhood. Those cool evenings must be the thing that has inspired it. No time like the present though! Today is the perfect time to start getting your home ready for winter. Do you need a little help preparing for the cooler days to come? Here is tip that will save you some money, while keeping you more comfortable. Try switching your overhead ceiling fans to a clockwise direction. That helps to pull up cooler air that lingers around the floor and force warmer air down. It doesn’t sound like much, but it might save you a degree or two on your heating bills. Every little bit helps right? Another thing you can do is to add curtains to your windows. Not only do they add a stylish touch, but they also help to keep cool nighttime air out of the room when your curtains are drawn at night. You can open them up to let the sunshine in come morning, which will naturally warm up the room, but those cool drafts off windows will be minimized in a decorative way, saving you heat and dollars. One more step to take before turning the furnace on for the winter is to add layers to your wardrobe. It is officially Fall, so those shorts can safely be put away for the season. It is time for sweaters, long pants, hats and maybe even some long johns for the youngest members of the family. That extra layer will help keep your baby warm regardless of the temperature. Of course, we’ve already suggested extra blankets, but how about going the direct route. Why not eat or drink warmer items? Start making soups to warm your bones. A roast in the oven warms up the house at the same time that it bakes up a tasty dinner for the family. And nothing says warmth like a steaming mug of hot chocolate on a brisk Autumn day. What are your best tips to keep warm when the mercury drops in the Fall? Christmas might be three months away, but Halloween is only one month to go! And Babybox.com has plenty of spooky items to tickle your little ghoul’s funny bones with. Get in the spirit of things with these creepy offerings from Babybox.com’s Halloween department. Happy Halloween for your baby. Adorable and fun. Our itsy bitsy spider set is perfect for your baby’s first halloween!! Our cute baby shoes are hand painted with sweet spiders and is matched with our hand painted spider onesie! These scaredy cat mary jane shoes are a must for any girl this Fall. These will be the hit at school during the month of October and Halloween. Kid’s LOVE them (and so do adults!) Now with glow in the dark ghosts!!! Available in infant/toddler whole sizes 1 – 10 only! NO size 3 or 4 in Velcro style – will be substituted with buckle style but please check the measurements under my profile- buckle style runs smaller than these. Designed with a strong durable sole, these shoes are perfect for your active child. Also make a great baby gift and addition to any wardrobe. Available in sizes ranging from infant to youth. This is the perfect Halloween Gift Set for your teeny trick-or-treater. This fun keepsake set comes with a personalized long sleeve bodysuit made out of 100% soft pima cotton, a coordinating personalized, orange-trimmed bib and a matching soft Pumpkin carrier made by North American Bear. The small gift tote is a great item for many years as it doubles as a trick-or-treat bag. This Halloween personalized tee shirt with skull and bones design is the perfect way to celebrate this holiday with style and fun. The skull and bones design in orange and white with black trim is printed on a 100% white cotton. Soft and comfy, it is a great companion for jeans and other bottoms. These shirts are not pre-shrunk. Available in classic or girly (fitted style) and with short and long sleeves. Style also available with pink bow for girl. Bring the magic of Halloween in the mealtimes of your child with this Halloween plate. The plate is approximately 10 inches in diameter and is dishwasher safe and non-toxic. It features a matte finish and can also be personalized in your choice of dish style, color and font. This BPA free plate is durable and safe for children of all age groups. It makes an excellent keepsake item that will be treasured for long time. Christmas: It’s 3 Months Away! It’s three months til Christmas! Have you started your shopping yet? Let Babybox.com help you get a head start on your holidays this year. When you want personalized gifts, that extra time is necessary too. Plus, the earlier you prepare, the more time you will have to enjoy the season with friends and family. Isn’t that what the holidays are all about? This jolly Santa handpainted Christmas tree ornament will light up your room and be a wonderful addition to your holiday decorations. on a blue background and is finished with a green ribbon for hanging especially for a boy. Personalized with your child’s first name and year, each ornament is heat sealed using original artwork. Makes a wonderful keepsake. This personalized plate is perfect for celebrating Christmas. The beautiful ceramic plate features a cheerful young girl in a Santa hat in the center surrounded by an array of colorful design. The outside of the plate is decorated with your baby’s name, and “cookies for Santa.” All letters are lower case. Plates measure approximately 8 1/4″ and are made from imported Italian bisqueware which is dishwasher and microwave safe. This personalized #1 On Santa’s List tee shirt is the perfect way to celebrate Christmas in style and with fun. The colorful contemporary design is printed on a 100% white cotton. Soft and comfy, it is a great companion for jeans and other bottoms. These shirts are not pre-shrunk. Available in classic or girly (fitted style) and with short and long sleeves. Make your baby’s first Christmas cozy with this amazingly soft marshmallow fleece blanket in winter white! Adorned with either a Santa, reindeer or bear, this blanket can be personalized with baby’s name, initials and year. Practical for everyday use, this inviting blanket will keep your little one warm and snuggly. Makes a wonderful holiday gift and keepsake. This week is looking to be a beautiful week, weather wise. There is sunshine forecast and almost summer-like weather to bask in. During the day that is. Once the sun disappears, the temperatures are set to plummet! Unless you are ready to turn on the furnace, it is time for some extra blankets on the bed I guess. Can Babybox.com help you out with that? Here’s a blanket for baby. This hand knitted and crocheted baby blanket comes with a crocheted toy attached by a crocheted string to the inside of the pocket (so it will never get lost). Your new baby will find not only comfort but companionship with their new Gator Pocket Blanket. Wrap your little one in the cozy, colorfully striped blanket and let them sleep happily with friendly gator at their side. This cashmere baby blanket with classic star at the center is a wonderful gift for a new baby. 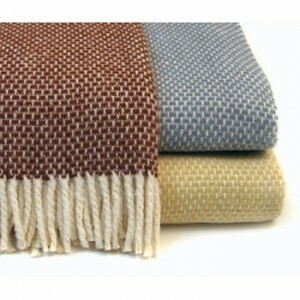 Classic star design, perfect for a boy or a girl, covers the front of this luxurious single faced 100% cashmere blanket. 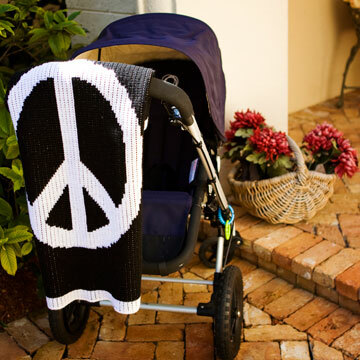 These blankets & pillows are a baby’s first luxuries, made with love. They will certainly be loved long after your baby isn’t so little anymore though. Your big girl will love this full size chevron blanket on her bed. What better gift for her birthday or her new dorm room at college. The generous size (36” x 53”) of this blanket are perfect for adding to the end of a bed, on a couch or chair. Available in different color combinations to suit any taste, making it an ideal gift for infants as well as the older children. Measures 36” x 53”. With a wide range of colors and fonts to choose from, this blanket can be ordered in either luxury cashmere and soft acrylic material. Acrylic never fades or shrinks and is very long lasting. For cashmere (9 colors) or acrylic (18 colors) and 6 fonts. This blanket is decorative, practical and makes the perfect gift for infants and older children alike. Mom and Dad aren’t impervious to the cold either. This fringed throw blanket – rice pattern is a cozy way to keep the chill away. 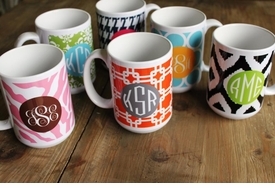 With several colors available, as well as the option to add a monogram or other personalization, you might want to get one for every member of the family. It measures a generous 55 x 70, perfect for snuggling! The official start to Fall is this weekend. You can feel it in the air already though. We might still have some warm, sunshiney days, but evenings are noticeably cooler and the odd tree has started to change color already. Have you made it apple picking yet? This weekend might be the perfect time to give it a try. Don’t you just love this time of year? Babybox.com does! This “Fall Birdies” wall art from Oopsy Daisy by Megan & Mendy Winborg features the fall seasons with all the birdies geared up. This top quality canvas reproduction is made using the Giclee printing process and has the look and feel of an original painting. Each canvas is stretched over wood bars, glass-free, and comes ready to hang! No framing is required. This is the ideal surface for kid rooms as there is no glass to break! Artwork is finished on all sides and comes with a wire hanger for wall mounting. It can easily be wiped clean with a soft, dry cloth. Makes a great gift idea. Designed by artist Megan & Mendy Winborg and it comes with the designer’s biography attached to the back. These whimsical hand painted wooden wall letters (“Autumn Paisley Hanging” Design) are the perfect addition for any nursery, children’s bedroom, playroom or bathroom. Each wooden wall letter is hand painted and is one of a kind. The letters are sanded, primed and then painted to match ANY theme you desire. (If you provide us with a sample or the name and manufacturer of your child’s bedding, we will coordinate the letters to match. We welcome swatches as well as links so that we may match your theme as closely as possible.) You can spell out your child’s name for the bedroom or the words “bath”, “let’s play!” etc. to add some fun to the bath and playroom. Please let us know if you have something special in mind for the designing of your letters. Ribbon is available upon request, otherwise hardware will be attached to your order. You are not limited to the designs you see on this web site. Custom order requests are welcome. This beautiful letterpress personalized “Fall Dots” gift wrap is fun and festive. This personalized gift wrap is a distinctive and meaningful way to decorate the exterior of your gift with any wording of your choice. Personalized wrapping paper is the perfect way to gift wrap holiday gifts, birthday gifts and baby shower gifts. It is different from others as a unique nine step stamping process is used to produce each roll. Perfect for the fall transition, check out Kayce Hughes women’s pj – green fall flower flannel. Our cozy PJ’s have an elastic waist and a loyal following. We have done them here in our cozy flannel. They will quickly become your favorite sleepwear this Fall! Do you have a difference in seasons where you live? What do you like best about Autumn? This time of year, the doctors must be afraid that they will go out of business then! Autumn might be when other produce is done for the season, but apple picking has just begun. That means apple pie, apple crisp, apple cider, apple butter, candy apples, oh heck, its apple heaven in my books. Considering apples are a great source of vitamin C, fiber and are low in calories, it’s no wonder that they are one of America’s favorite foods. They help to lower cholesterol, regulate insulin levels, and are a good part of a heart healthy diet. No fat or sodium is found in these delicious treats, so help yourself to one today! Babybox.com is! These personalized everyday notes “Apple of my eye” design by Kelly Hughes are perfect for saying thank you or writing a personal message to a friend! They are available in two layouts – Flat Notes and Folded Notes. Perfect for sharing some news or sending happy greetings or invitations. Choose from several font styles(Shown here is the Papyrus font). Personalize these with your child’s name or be creative and use a favorite quote or saying. New Arrivals Inc. Bloom in Apple Baby Bedding set lends a chic and sophisticated look to baby’s nursery. The set features a charming damask print in pink and green colors. Bloom in Apple’s bumper is made of Bloomin’ in Apple fabric with Cotton Candy Pink Solid cording and pink grosgrain ties. All bumpers are slip covered for easy cleaning. The sheet is of Bojangle in Apple fabric, and the 17″ drop tailored skirt is made from Birdseye Pique fabric with Bloomin’ Damask in Apple panels, Cotton Candy Pink Solid band and Scalloped Pink Ribbon bows. The three piece baby bedding set includes bumper, sheet and skirt. Make it a four piece set by adding the coordinating blanket, made of Bloomin’ in Apple fabric with Cotton Candy Pink Solid ruffle. Also available coordinating Curtain Panels, Throw Pillow, Changing Pad Cover & Memoboard. Handmade in the USA. The “Apples and Inchworms” wall art from Oopsy Daisy by Gale Kaseguma is colorful with soft hues that every child will love. This top quality canvas reproduction is stretched over wood bars with no glass to break. This piece is made using the Giclee printing process and has the look and feel of an original painting. It is equipped with a wire hanger on the back for easy wall displaying so no framing is required. It can be wiped clean with a soft, dry cloth. Makes a wonderful addition to any child’s room, playroom or even beach house. Designed by artist, Jenny Kostecki with biography attached to the back. This handpainted ornament for that special teacher in your life is a perfect gift for all ages. Each tile is finished at the top with a coordinating ribbon for hanging. Personalized with your teacher name and year and greeting, each ornament is heat sealed using original artwork. Makes a wonderful keepsake. It has happened again. Tragedy has been meted out in the Nation’s Capital. Today, 13 people were killed in the heart of a Navy Complex in Washington. It is early to speculate, but in the wake of these senseless killings, we are reeling at this fresh loss of innocence. It is too soon on the heels of the anniversary of 9/11. It is always too close for comfort. One cannot help but remember the recent scenes of death in Boston, at Sandy Hook Elementary, in a movie theatre in Aurora Co, at an army base in Fort Hood, Tx, and too many more place where terror has reigned supreme. We are due for a whole lot more peace. We need an end to war in Syria, Sudan, Egypt, Pakistan, Mexico, and beyond. People need to stop fighting in Israel and Pakistan, in Niger, Yemen and in too many hotspots around the globe. What we really need is Peace around the World! What has happened to people spreading love and happiness, goodwill and friendship to all around us? Don’t enough parents teach their children to respect others, their thoughts, feelings and rights? Haven’t we learned enough from others past mistakes? Can’t someone just wrap the world in a blanket of peace and make it stick? I don’t know what is going to happen in Washington tomorrow. People there will need to get over their shell shock. They will need some way to feel safe and secure again. They will need answers and a means to be able to return to some kind of sense of normal once more. It makes me sick that tragedies like the one in the Washington Navy Yard happen. All we can hope is that one day we will learn from the mistakes that continue to plague us. All we can pray for is peace for all. Hmm, perhaps that’s a story for a different time. Anyway, Babybox.com loves pregnant women regardless of their good days and bad. That’s why we have so many items that are specially crafted with them in mind. 13 cheers for round bodies this week! Keep track of all your pregnancy moods with this Pregnancy Dress Forms note pad. Daddy will appreciate this perfect gift for Mom. The perfect magnetic notepad for an expecting mom. Note pads measure 3 3/4″ x 9″. Printed on recycled warm white text weight paper. This Butterflies & Hiccups Pregnancy Journal, beautifully illustrates the miracle of pregnancy with such grace and charm. Each month contains thought-provoking questions that prompts the new mother-to-be (and father!) to capture the most important moments of pregnancy. There is plenty of room to record practitioner visits, baby’s development, the physical changes and symptoms as well as special circumstances during pregnancy so you can customize your journal to reflect your unique experiences during this exciting time in your life. There is even room to include a picture each month, if desired! What’s pregnancy without a baby shower? This baby shower favor is perfect for giving to all of your guests – indulge them with these tiny cases of luxurious hand cream. This delicate “whipped” blend of peonies, jasmine and white lilies is sure to become every girl’s favorite. The perfect size to pop into your pocket or handbag for on-the-go hand replenishment. These luxurious hand creams come personalized with your chosen text, color and design – a “goo goo” baby symbolizing the sweet bundle on it’s way, a onesie to coordinate with the shower details, or a little ducky to show your playful side. And for the days when the Mom-to-be’s emotions are getting the best of her, why not give her a little something to let her know how special she is. This beautiful bracelet just might do the trick. An assorted arrangement of beads displaying amorous Circle of Love charm, this handmade, fine silver bracelet can be personalized as per your own choice. Embellished with multiple strands of delightfully mixed semi-precious beads including Amethyst, Peridot and Tourmaline, this contemporary bracelet is filled with enchanting charisma. To add to its strength it has been incorporated with a heavy duty sterling lobster clasp and silver linked chain. It’s a total dazzling and exclusive piece of jewelry!